Till next we meet, vicious hellbeast. At E3 this year, 2K Games president Christoph Hartmann officially stated Turtlerock Studio's Evolve would be "the defining next-gen experience of 2014." Well, that's going to be a pretty tough sell considering 2K's parent company, Take Two Interactive, has delayed the game until February 10th, 2015. Evolve won plenty of critical praise at this year's E3, taking home the coveted Game Critics Awards "Best In Show" accolade. 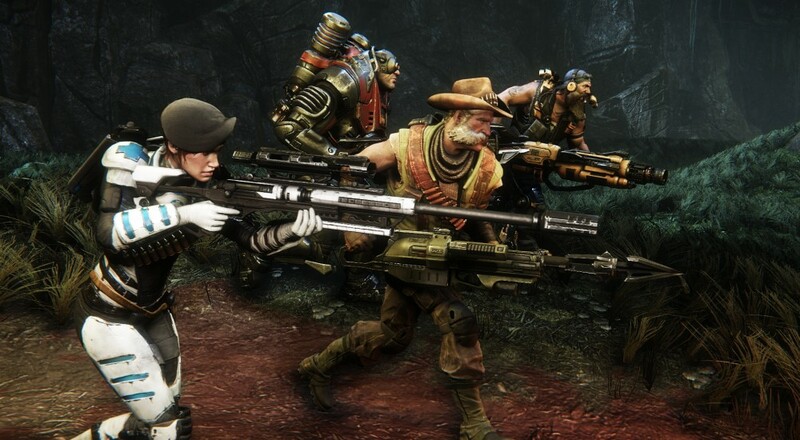 "We are encouraged by the overwhelmingly positive response from press and fans, and believe by extending development by a few months, it will allow the team enough time to fully realize their creative vision for Evolve," said Take Two Interactive President, Karl Slatoff. We thought pretty highly of our hands on with the game back at E3. You can also check out our video interview with Turtlerock Studios at the event. Given 2014's pretty scant release schedule, it's a bit of a bummer to see one of the headliners pull out until next year. However, giving Turtlerock a few extra months of extra polsih might turn a great product into a fantastic one. "Historically, we've always benefited from giving the creative teams more time to polish the titles; we've never regretted it," noted Take Two Interactive's CEO, Strauss Zelnick. I guess we'll see how our heroic hunters will fare come next February. Update: We originally reported February 21st as the launch date, it's now February 10th.